Here, at Gopi Talaiya under a shady tree, Shri Mahaprabhu Vallabhacharya halted. Krishnadas Meghan asked Shri Mahaprabhuji why Gopi Talaiya was there when the Gopis always lived in Braja and not near Dwarka at Gopi Talaiya. The guru explainec, “Once while Shri Krishna resided in Dwarka he praised the Gopis of Braja in front of his Dwarka Queen Rukmuni. 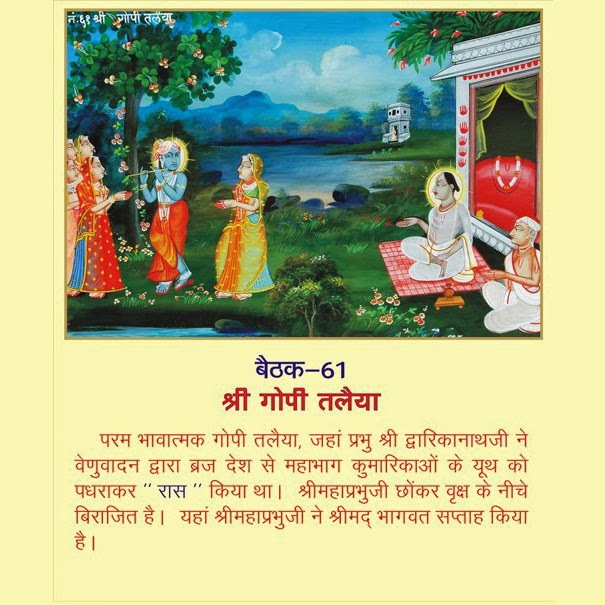 The Queen then said that she was his completely faithful wife but the Lord mentioned, “No doubt your devotion to me is great, but the Gopis of Braja broke all their worldly ties and religious codes for My sake. They came to me in the middle of the night. I don’t think even you, my wedded wife would leave everything and come to me in the forest at midnight on the mere calling of my flute.’ Rukmuni confidently replied that she certainly would. “That evening Shri Krishna came here to Gopi Talaiya and played His flute. Rukmuni and Lord Krishna’s other sixteen thousand wives stopped adorning themselves when they heard the flute but then they hesitantly thought that if their relatives and others were to ask them where they were going, they would not be able to answer them and ultimately reasoned that it would be better not to leave the palace. When the Gopis of Braja heard the flute, they left everything and came to this spot and sported with the immortal Lord. That is way the sacred clay here is called Gopi Chandan. Krishnadas then prayed to have that divine vision and the guru gave all the bhaktas present there divine eyes to witness the Lord’s lila with the Gopis. After speaking the Bhagavata for seven days, Shri Mahaprabhuji proceeded to Shankoddhar.